Hotel pick-up at 6:30pm. The guide will wait you at your hotel lobby, by holding a paper sign with your name on for you to recognize. Drive to the Beijing Night Show Theater. 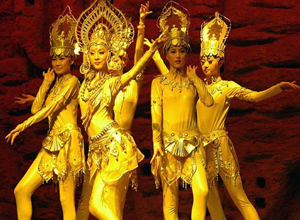 Take a Chinese Dinner (7:15-8:00pm) before enjoying the gorgeous Chinese Imperial Dance and Music performance. Drive back to your hotel. End of our service. *Private English-speaking tour guide and private vehicle. *Above price is based on the economic seat of Beijing Night Show Theater. If you prefer other class seats, please kindly inform us in the reservation form. *If you just prefer a economic ticket without a need of private tour guide and driver, please also kindly inform us in the same way. The disount price of a economic seat is $42/￥280. *If you are a group of 10 or 10 people above, please tell us, we could give a very competitive discount. *Payment in advance, or you can pay cash to the tour guide when you aboard the vehicle. *If you need to prolong your stay in Beijing, or arrive a few days earlier, please let us know and we’d be happy to extend your hotel bookings, or arrange additional tours for you.